A place where I can talk about my hobbies, my pets, my family and whatever I want. Well my partner finally received the things I sent. So here are the pictures. 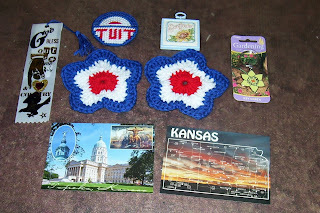 The star coasters came from crochetmemories . 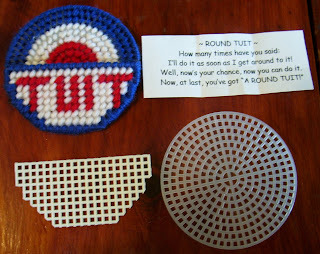 The Round Tuit I just made myself as I didn't have a pattern. Used a 3inch craft circle and just used the colors I wanted for the exchange. And for the poem I did a search on Goodsearch for "A round tuit Poem" and just used one of the poems I found. I’ll do it as soon as I get around to it! Well, now’s your chance, now you can do it. I am now widowed having lost my husband of over 45 years on Nov 16, 2011, have a son and daughter, 5 grand kids, 5 great grandchildren, 1 cat. Worked at local Police Dept for 27 years. Retired in July 2005.
calming force in the blogosphere. you're more likely to share than rant. your life is a (mostly) open book.